The Thule 1050-22 is a fork mounted bike carrier for Thule and Yakima crossbars. Its aluminum construction in both the head and tray provides a sleek, low profile tray design. Includes a long-throw, quick release that provides excellent security and durability. The rear bike tire is secured by a nylon ratchet strap that is adjustable and fits skinny road tires and up to a 2.1-inch mountain bike tire. 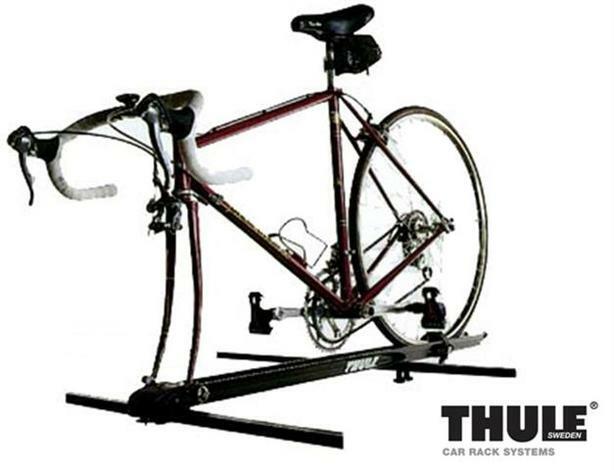 The Thule 1050-22 rack comes complete with all mounting hardware for quick and easy installation. Used, but in good condition. *	Carries bikes with wheelbases up to 48" and tire widths up to 2.1"